How Some Of Haiti’s Elite Helped Screw 50,000 Of Their Own! News Americas, NEW YORK, NY, Fri. May 26, 2017: Last Fall in Little Haiti in Miami, Florida, a group calling itself ‘Haitians For Trump,’ emerged buoyant in their shocking support of then Presidential candidate, Donald J. Trump. The stunning endorsement from a black, immigrant bloc stunned other immigrant and minority groups, given the fact that Trump began his campaign with stinging anti-immigrant rhetoric; continued that theme throughout the campaign, especially at his rallies, and pushed a racist draconian immigration policy that called for mass deportations, including of those benefiting from what was called “temporary amnesty,” aka, Temporary Protected Status, (TPS). But on Friday, September 16, 2016, many Miami-based, Haitian elite, including Leonce Thelusma, a former Haitian finance minister; former President of the National Assembly and former Senator Bernard Sansaricq; Ringo Cayard and many Haitian doctors, lawyers and professionals, welcomed Trump gleefully to the Little Haiti Cultural Center in Miami, Florida. Most used their anger at the Clintons and the perceived way they have acted towards Haiti, as a reason to support The Donald. Thelusma said at the time that Hillary Clinton has little to show for her and her husband’s involvement in Haiti, even as Bill Clinton served as U.N. special envoy and czar of the recovery effort after the 2010 quake. Fast track to 8 months later! After weeks of protesting, tweeting and numerous news stories calling for an extension of TPS for the 50,000 Haitian immigrants who were beneficiaries under the Obama administration in 2010, the Trump administration’s response was to essentially give the bloc a 6-month eviction notice. On Monday, May 22, 2017, Secretary of Homeland Security, John F. Kelly, grudgingly granted a maximum six-month Temporary Protected Status extension to the Haitian immigrants. The U.S. Citizenship & Immigration Services, (CIS), also repeated this in their notice advising Haitian beneficiaries on how to re-register. “During this six-month extension, beneficiaries are encouraged to prepare for their return to Haiti in the event Haiti’s designation is not extended again, including requesting updated travel documents from the government of Haiti,” the statement issued on May 24, 2017 said. In other words – this is your expulsion notice so use the time we have given you to pack up your things, make the arrangements and go back where you came from! 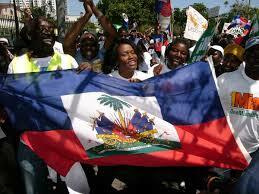 Nice going Haitians for Trump! Because of your short sightedness you have just screwed not only all of us, but your own people who have now been put on notice. Worst of all, all detailed information on where these 50,000 people live and work are in the immigration system making them easy prey to be rounded up and deported by U.S. ICE. Now stop and think for one moment if Hillary Clinton was president if this would have occurred? I think not! But its Trump time so use the next six months to pack well my dear Haitian brothers and sisters; ensure you re-register by July 24, 2017 and request a new Employment Authorization Document (EAD) as it could very well be your last, thanks to some of your very own! It was Happening under Obama you idiot. But you’re probably not an idiot, you just want to feed a propaganda. David C. Thanks for your input, even though it is a bit arrogant. Please keep in mind this site posts aggregated articles from other sites as well, so that folks can see ALL points of view.